LONDON, Ohio — From the ground, it looks like just another Midwestern cornfield. Nothing special. 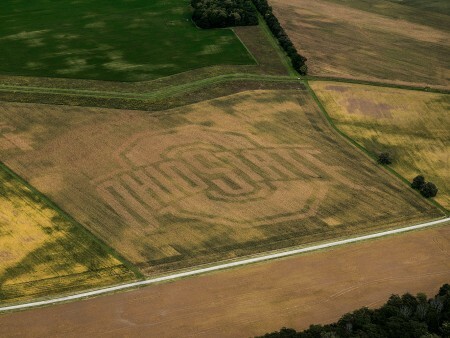 Fly a few hundred feet above the cornfield, and a clear image comes into view: a Block O with the words “Ohio State” angled through the middle of it. You’ve heard of smart phones, smart highways and now… a smart planter. As the planter was driven across the field, its computer system knew the rate and variety of seed to sow in each area, having noted the differences in soil type, terrain, drainage and organic content within the same field. The logo stands in a field at the Molly Caren Agricultural Center in London, Ohio, home to the Farm Science Review, an annual three-day agricultural trade show, sponsored by the College of Food, Agricultural, and Environmental Sciences at Ohio State. This year’s Review is Sept. 19-21. For last year’s Review, Brutus Buckeye grew up in a field as a result of the same precision planting technology, and before that, a plain Block O — without the words “Ohio State” —emerged. Each image proved challenging for different reasons. While farmers may not want to brand their fields with Ohio State logos, they could see the value in having a planter that can easily sow multiple hybrids of corn or soybeans in the same field and at different rates. A section of a field with rocky terrain may get fewer seeds sown to compensate for the expected lower rate of success for each seed. Alternatively, the base of a hilly section that’s rich in organic matter may get more seeds because more of them are expected to grow in that area. With a standard planter, a grower can’t easily plant one variety of seed, then switch to another. However, there are significant costs associated with the newer technology. Purchased new, a traditional 16-row planter costs about $160,000, and the multi-hybrid and other planter technologies add another $50,000 to the pricetag, Klopfenstein said. Using a multi-hybrid planter, research has shown, can lead to a 4- to 5-bushel increase in corn yield per acre, he pointed out. That’s because with a multi-hybrid planter, the right corn hybrid and seeding rate are matched to the soil’s potential to produce grain. The smart planter “knows” about the various soil types and terrain of any field because the data was uploaded to the planter before it sowed the first seed in that field. The brainpower in the machinery that planted the Ohio State emblem is a series of electronic control units in the planter and in the tractor pulling the planter — technology made by Illinois-based Precision Planting. The smart planting demonstration is part of ongoing research into precision agriculture in the Department of Food, Agricultural and Biological Engineering at Ohio State. More information on the precision agriculture program is at fabe.osu.edu/precisionag. Advance tickets for the Review are $7 at all Ohio State University Extension county offices, many local agribusinesses and online at fsr.osu.edu. Tickets are $10 at the gate. Children 5 and younger are admitted free. Hours for the Review are 8 a.m. to 5 p.m. Sept. 19-20 and 8 a.m. to 4 p.m. Sept. 21.